Today we welcome a brand new columnist, the up-and-coming author Shannon Young. This past summer, Shannon announced she’d cut 18 inches off her hair, quit her day job to become a full-time writer, and given herself a pen name for her new series of adventure novels. And, yes, she is an expat, a kind of love refugee, living in Hong Kong. She has generously agreed to chronicle her writing adventure for us. In this column, I’ll be recording my experiences as a full-time expatriate writer. Officially, this is only a test. Let’s start with a bit of background: I have been an expat, an American in Hong Kong, for four years and one month. For the past four years, I taught English in a local primary school while harboring a desire to work in book publishing. Originally, I wanted to be an editor, to find talented writers and help them get their work into the world. I didn’t think I had stories of my own. Then, I moved to Hong Kong. In my new expatriate life, I found stories: personal dramas, bewildering worlds, opportunities for stimulating observations, and even ideas for fiction. I discovered I love the process: mulling over half-formed ideas, stealing character descriptions from people I saw on the street, scribbling outlines on everything, and sitting down in coffee shops for hours at a time to actually do the work. Four years later, I’ve completed a number of projects composed of bytes and bits of code, of pages and ink, of words and stories. Each project has taught me to look closer at the world around me. Each project has challenged me to be more diligent and to look for opportunities to write something that will matter. One of those projects, a Kindle single called Pay Off, discusses how my teaching job in Hong Kong enabled me to pay off my large student loans from a US university. I’ve been debt free since December 2013 so have been able look seriously at other occupations. My teaching contract ended in July 2014. By that time I had accrued some savings, some complete or nearly complete books, and a husband with permanent residency. Instead of continuing to teach, I realized that now was the time to try to make it as a writer. This is only a test. If I am not bringing in enough money from my writing (or worse, not enjoying the work) around Chinese New Year, I will start looking for a new job. For now, I’m jumping in with both feet, seeing if this dream is feasible. Quitting a day job to write full-time is a lot like moving to a new country. You might know a bit about what to expect and what to pack. You do your homework; you find stories of people who’ve done it successfully, who love their new lives. You also find stories of people who’ve failed, who didn’t gel with the new place for any number of reasons. Most expats fall somewhere in between, learning to live with the difficulties while also enjoying many good moments. Some people say it isn’t possible to make a living as a writer. They cite the successes and insist such people are outliers: exceptionally good or exceptionally lucky. As with moving to a new country, I suspect the truth lies somewhere in between. All I can do is take the leap and see if I can make it work. 1) A portfolio of published works—comprising not just the student debt Kindle single but also the anthology How Does One Dress to Buy Dragonfruit: True Stories of Expat Women in Asia, which I edited for a small Hong Kong publisher. It came out earlier this year. * Neither of these works is a huge moneymaker, but sales can add up slowly. More importantly, these two publications have given me valuable publishing experience. 2) A book deal. My memoir of my first year in Hong Kong, Year of Fire Dragons, is being published by Blacksmith Books, an independent Hong Kong publisher, at the end of October. Hong Kong is a small market and even healthy sales won’t pay my rent, but at least I have a book to launch and a tangible opportunity to build my career. 3) A genre series in the works. This is the essential part of my strategy, the heavy winter coat, if you will, that I’m packing as you never quite know, once you become an expat, where you might end up. (I’m in Hong Kong now, but as I never could have predicted that, shouldn’t I be prepared for the day when I move to, say, Finland?) Since late 2012 I have had the wild pleasure of working on a series of post-apocalyptic adventure novels set at sea called The Seabound Chronicles (under the pen name Jordan Rivet). I’ve planned for a four-book series and written drafts of three of the titles. Book One, Seabound, is currently with the copy editor and should be ready to launch in November. I plan to self-publish this series as e-books and POD paperbacks and, frankly, hope to make some money. 4) Last but not least, reasonable expectations. While I am hopeful that the combination of my publishing experience so far, my existing works, and a highly commercial series will enable me to continue doing what I love, I am also realistic. I don’t expect to get rich. The goal here is to build up an audience—and a long tail of sales—that will eventually enable me to pay my rent and buy the occasional plane ticket home to see my family. But my primary expectation is that I will work hard, produce the best books I can, and try to learn as I go. I realize I’m taking a risk by forgoing a steady income and living on savings in order to give myself more time to write. But taking risks is second nature to expats. We leave behind everything we know, and there are never any guarantees about how things will turn out. My own jump into expat life occurred when I followed the man I loved to his home country. At the time, I didn’t even know if we would get along when we finally lived in the same country. At first, it looked like everything would fall to pieces because a month after I arrived in Hong Kong my boyfriend’s company sent him to London. I had a year on my own in Asia, fearing that my risk had been in vain. That story has a happy ending: that boyfriend is now my husband—and I love Hong Kong. It was a risk that paid off, but it could have gone very wrong. Now, I hope the risk I’m taking will turn out at least half as well. And can I tell you a secret, diary? Since I stopped working and started focusing on writing full time, I’ve been deliriously happy. I love having hours to myself each day to sit down and work on my own creative projects. I love reading about the publishing industry and studying other people’s books and careers. I’m trying hard not to become an obnoxious friend who only talks about their own work because it’s all I think about these days. Yes, I know this honeymoon period won’t last forever, but at least allow me to say: it’s been wonderful so far! And yes, I sometimes struggle with prioritizing, but that’s because there are so many things I want to do! But I’m gradually getting used to my new routines and performing triage on my to-do lists. I’m developing the daily habits of a writer. I want to use this period well. Each month, I’ll share a bit more with you about where this journey is taking me. I hope you’ll come along for the ride. *From now until the end of the year, Shannon will be sharing excerpts from Dragon Fruit. Stay tuned! Readers, it’s your turn. What is a risk you’ve taken in order to follow a dream? 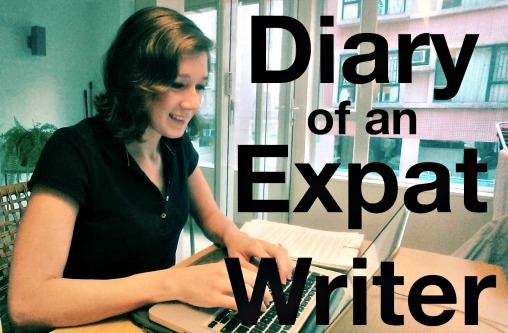 Was it becoming an expat or something even more daring, like becoming a full-time writer? What are some difficulties you faced along the way? Let me know in the comments! I wish you luck with your writing and look forward to seeing your updates! Great post! Fabulous post! I’m so happy for you and see a glorious writing career ahead that will add to the wonderful work you’ve already completed! I feel like I risked a lot by moving to the suburbs seven years ago. I was happy to have a chance to be a stay at home mother, but I missed living in the city. That’s when I decided to write my memoir. And it’s been a blast. I don’t have many distractions in the suburbs, so it’s worked out well! Can’t wait to hear more about your writing process. Thank you, Susan! I love that you describe moving to the suburbs as a risk–and one that ended up being well worth taking. It’s great that you’ve been able to pursue your dream of having your memoir published and that you’ve succeeded without living in the big city. Thank you, James. I’m excited to be here! “since I stopped working and started focusing on writing full time, I’ve been deliriously happy.” truly where you are meant to be. what an interesting and exciting life journey you have been on. i wish you much continued happiness. Thank you so much for your kind words, April! I’m still happy so far :). Shannon, just drop a line if you find yourself in Finland one of these days. We could have a writers retreat in Lapland over the summer when the sun never sets. Suvi, that sounds absolutely wonderful. I hope you are enjoying your life back in Finland. We miss you here! The standard line to writers is “don’t quit your day job” but you have a history of success: you’ve paid off your loans (congratulations!) and already published (congratulations again!). Plus you love what you are doing and are disciplined – so here’s to your continued success – with a few $$ – you deserve it! Thank you for your encouraging words! I hope it’ll all turn out well in the end, but you’re right that “don’t quit your day job” is the prevailing wisdom :). I can relate to your being ‘deliriously happy’ writing! I so get it! I used to live in HK and got so overworked, I now live in Thailand and write. and am also deliriously happy doing it. best o luck to you!